On the day of my very first food blogger joint dinner, the skies decided to present me with some of the highest temperatures I've ever experienced all year. While making my way to Sushi Bar Maumi to meet Food Wench from Drunken Noms and Picky Diner, I had to spend some time standing in front of the display coolers at IGA and wander around in a few air-conditioned hotels in order to prevent myself from turning into a sweat fountain. Thankfully, I budgeted plenty of time to ensure that I would still make it on time. Sushi Bar Maumi is operated by the sushi chef Maumi Ozaki and is one of the few places in Vancouver where you can get an authentic nigiri sushi omakase experience. 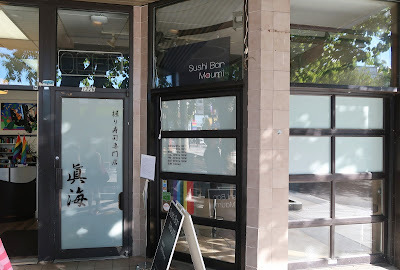 It is strictly a sushi bar, so the menu consists solely of sashimi, nigiri sushi, and a few appetizers (there are no sushi rolls or alcoholic drinks). Most of Sushi Bar Maumi's diners come to have their nigiri sushi omakase, which comes in three forms: 10 pieces for $40, 15 pieces for $60, and 18 pieces for $90. 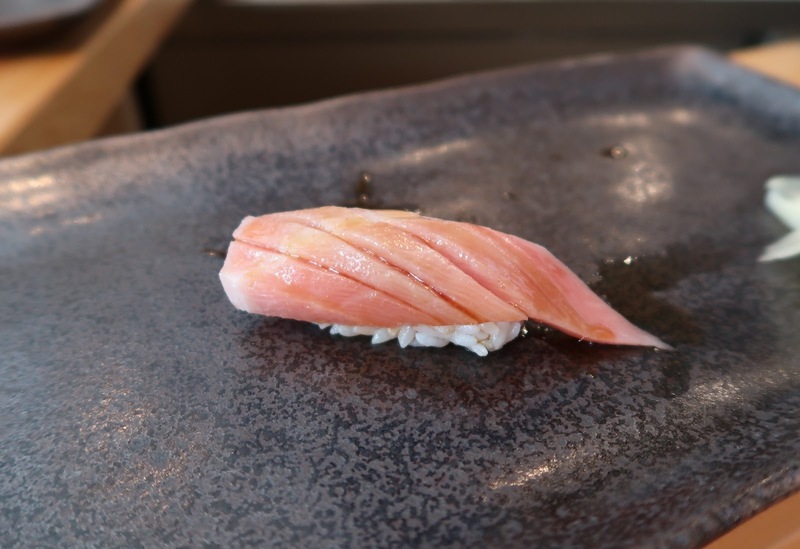 There are only ten seats (all at the bar), and as the omakase commences, each diner receives one large dish in front of them to hold the nigiri. 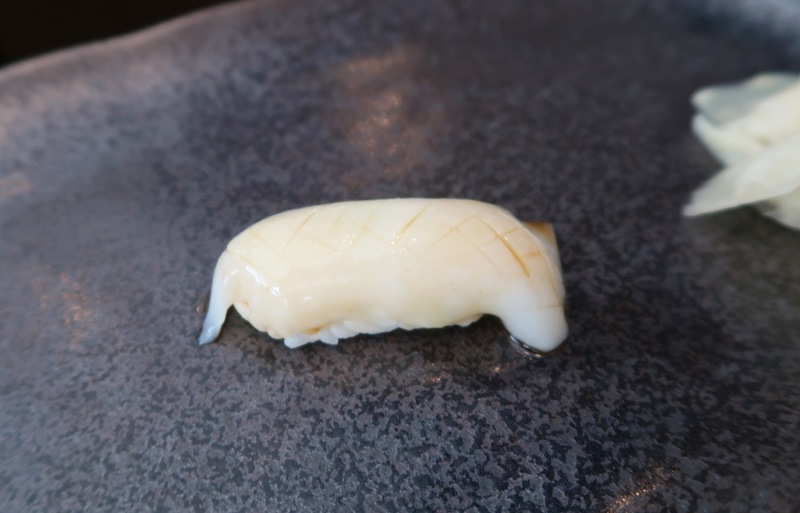 Then, like clockwork, the chef works his way around the bar and presents each diner with one piece of nigiri at a time. The pace was quite relaxed, and between each piece, I had the time to take photos, eat the nigiri, write down some notes, and then discuss various aspects of my life with my fellow food bloggers. After the omakase, you have the option to order additional pieces of nigiri from the à la carte menu, which is updated daily depending on which fresh fish they managed to import from Japan. You are allowed to stay for a total of 90 minutes. 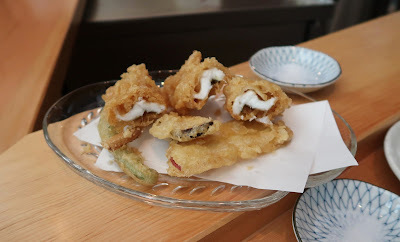 Surprisingly, our first dish, the Anago Tempura (sea eel tempura), was a hot mess (pun intended). The batter was quite oily, and the frying oil was quite obviously overused. 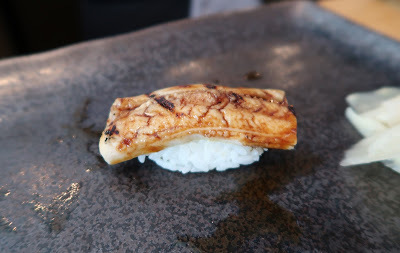 The distinct flavour of anago was lost, and this tasted much like any other battered fish. After biting into the anago tempura, my brain decided to spontaneously turn off and Food Wench, our vegetable expert, had to save me by identifying that the vegetable tempura consisted of one piece each of green bean, eggplant, and yam. There was also a crunchy fried fish bone added to the mix. With the very first piece of our $40 nigiri omakase, we were taken into a whole new world with the Mejina Nigiri (largescale blackfish). (I Googled an image of the fish out of curiosity and cannot get over how plump and cute it looks.) The sushi rice was excellent with just the right amount of vinegar. It was also packed loosely enough to complement the texture of the fish. 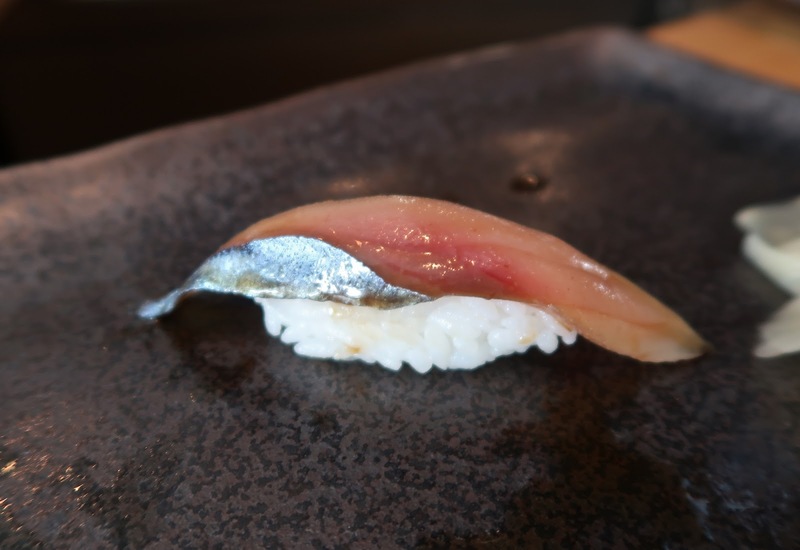 The blackfish itself had a nice, buttery flavour and an evenly distributed savouriness due to the fact that the sushi chef used a brush to apply a fine layer of soy sauce to the top of the nigiri. Picky Diner also remarked that there was a fair bit of wasabi placed under the fish. 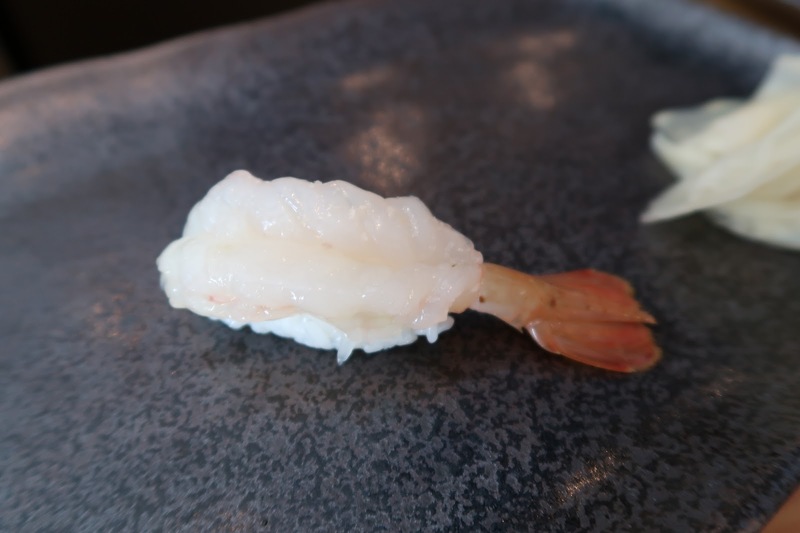 Among Food Wench's favourites was the Amaebi Nigiri (spotted prawn). The amaebi tasted fresh and featured a creamy flavour and a soft texture. They also provided us with the amaebi heads! 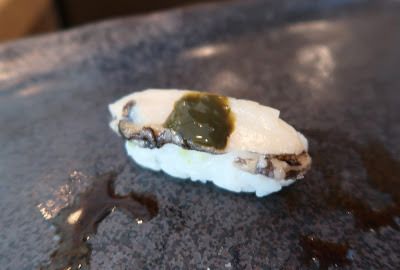 Along with the Mejina Nigiri, the Surume Ika Nigiri (Japanese flying squid) was a novelty for me. While I had no trouble recording the Japanese name for the nigiri, I kept thinking that the English name was Japanese line squid. That surely sounds like a very interesting type of squid. Once again, Food Wench came to my rescue and confirmed that the chef said Japanese flying squid. The squid had a delectable chewiness and was sliced to just the right thickness. Moving onto the realm of seafood that I am familiar with, the Hotategai Nigiri, which the chef described as fresh scallop from Hokkaido, had an amazing, delicate, sweet flavour and a soft, pillowy texture. The only issue I had with this piece was that the wasabi was a little too heavy. 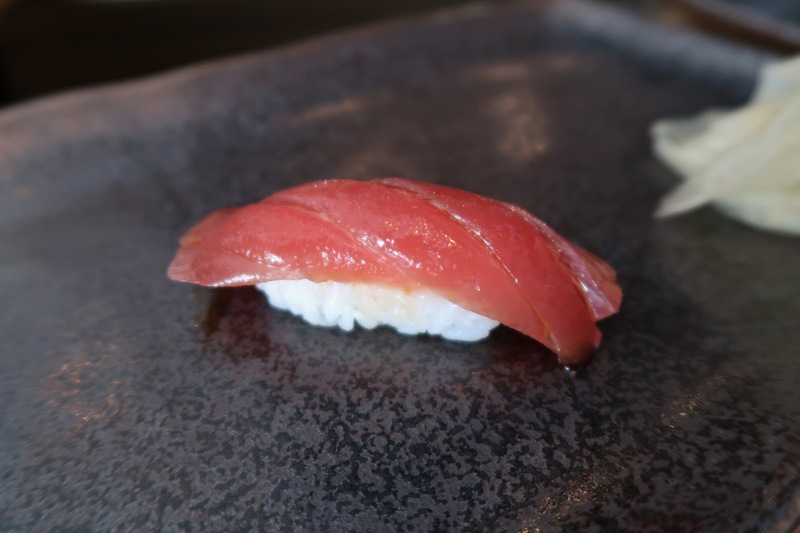 Next, the Mebachi Maguro Nigiri (bigeye tuna) was one of the meatier pieces we received and came with a pleasant, smooth texture. With this piece, the brushing of soy sauce really accentuated the flavours of the tuna and brought it to life. Once again, the only issue I had was the slight overage of wasabi. With the Shima-Aji Nigiri (striped jack), things went from very good to outstanding. Here, Sushi Maumi managed to beat the other restaurants that initially made shima-aji my favourite type of nigiri. 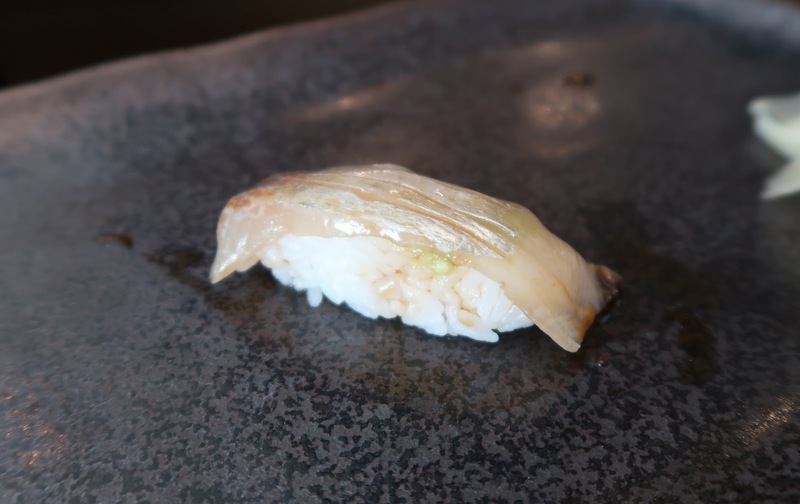 With an exquisite, smooth texture and a well-distributed hint of soy sauce, this piece of Shima-Aji Nigiri came as close to perfection as I could imagine Shima-Aji Nigiri to be. 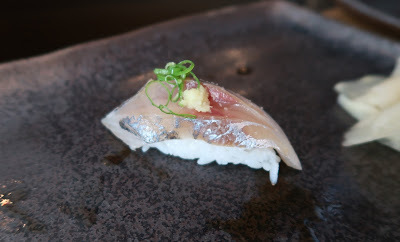 The Aji Nigiri (Spanish mackerel) was also one of the highlights of the omakase. It was very fresh and featured an excellent smooth texture. The garnish of green onion and ginger on top was a perfect complement to the aji and provided a nice zing. 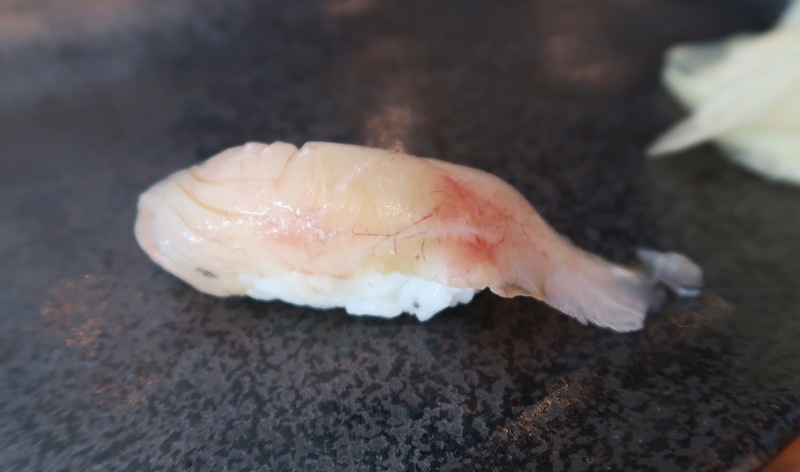 Another piece of nigiri featuring an extremely smooth texture and a delectable brush of soy sauce was the Kanpachi (greater amberjack). The kanpachi and the rice just melted in my mouth perfectly. Could I even ask for more? The Saba Nigiri (mackerel) featured a slightly leaner texture than the Aji Nigiri above and came without the garnishes on top. This piece had a richer flavour and a slight chew to it. 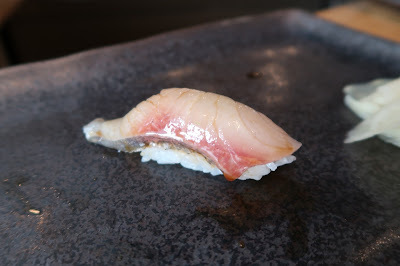 Finally, our omakase ended off with a few wrong notes on the Anago Nigiri (saltwater eel). It was a little softer than expected and tasted like it was baked without any marinade or sauce. The anago almost bordered on being bland, but I still have to give Sushi Bar Maumi due credit for the consistently excellent sushi rice. 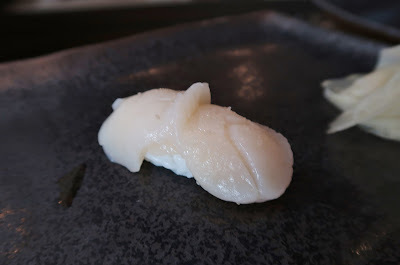 After the conclusion of our omakase, Picky Diner and I proceeded to try out the Ezo Awabi Nigiri (Ezo abalone). I've had abalone many times in Chinese restaurants before, but this was my first time having it in nigiri form. Neither of us liked this piece in particular. It was much chewier and harder than I expected, and I felt like I was chewing little blocks. It didn't have much of the abalone flavour that I am used to. I felt compelled to try something near the top of Sushi Bar Maumi's vast nigiri spectrum, so I went for one piece of Hon Maguro O-toro (fatty bluefin tuna). Due to sustainability issues (as bluefin tuna is an endangered species), I only order a piece of bluefin tuna once or twice a year (this being my first time this year). Picky Diner and Food Wench, being slightly more ethical than me, decided not to order this at all. The o-toro was served a noticeably cooler temperature than the other pieces, and was quite savoury and juicy. However, it wasn't quite as melty as the one I had at Octopus' Garden. 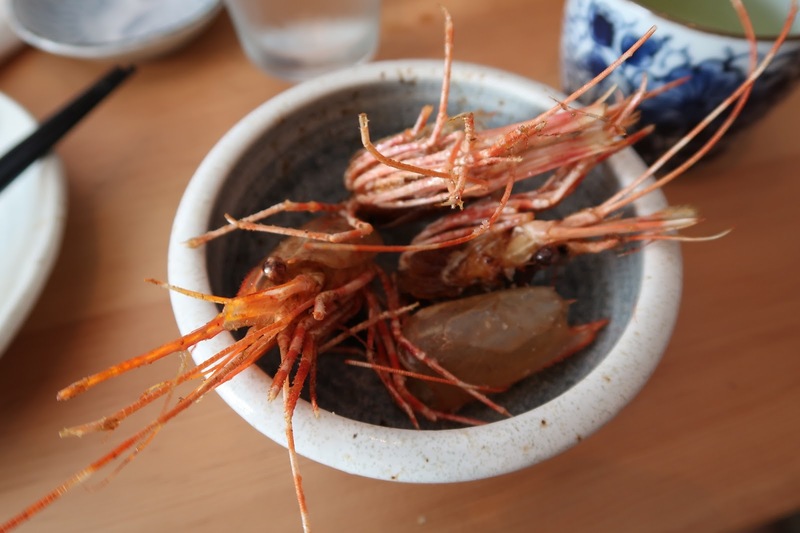 During the whole omakase experience, the sushi chef didn't converse with the diners very much, but the waitress came around regularly to make sure that everyone's tea and water were refilled promptly. 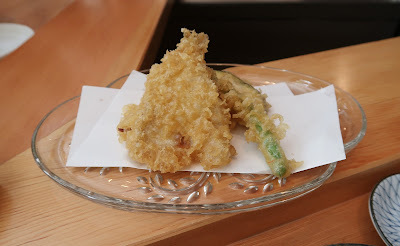 Aside from the tempura, I had a mostly excellent experience at Sushi Bar Maumi. The precision, care, and attention to detail are all clearly evident in the nigiri sushi. At one point, I started to feel a bit spellbound due to the consistently rich and luscious flavours of the nigiri. I could imagine all the delicious fish of the ocean swimming in my head. If it weren't for my eyes catching Picky Diner and Food Wench diligently pick up their cameras to take photos of each item, I would have forgotten to take photos of some of the nigiri myself. Click here to read Picky Diner's post! Maumi, Miku or Kaede? Traditional sashimi/sushi only. If you're looking for traditional sushi, Maumi would be my top pick! Kaide is also very good and is more affordable. Miku is more for fusion sushi.